https://matcha-jp.com/en/1231 Unlimited Traveling With The Tokyo Subway Ticket! Unlimited Traveling With The Tokyo Subway Ticket! Planning your transportation in Tokyo can be quite the headache for travelers. Unlimited subway tickets solve it all effortlessly, so you can travel worry-free! There are many places to see and experience in Tokyo, but planning out transportation can be rather harrowing. We recommend making use of Tokyo's convenient and massive network of railroads to facilitate your travels between sightseeing spots. In fact, Tokyo Metro has implemented a series of tickets that permit unlimited subway traveling, allowing tourists to utilize the subway at a reasonable price. This is the greatest option for you to travel in the city. This unlimited ticket is called the "Tokyo Subway Ticket", and it can be used for all nine lines of the Tokyo Metro and four routes of the Toei Subway. The Tokyo Subway 1-Day Ticket is valid for one day (800 yen for adults and 400 yen for children). The Tokyo Subway 2-Day Ticket is valid for two consecutive days (1,200 yen for adults and 600 yen for children). The Tokyo Subway 3-Day Ticket is valid for three consecutive days (1,500 yen for adults and 750 yen for children). These three types of tickets are available for purchase. Image source: Let’s Learn About Asakusa’s Kaminarimon! Whether you are touring famous Tokyo spots like Ueno, Asakusa, Skytree (Oshiage), Roppongi, Tsukiji or the Tokyo Metropolitan Government Building. Whether you are immersing yourself in Japan's subculture by visiting the town of musical instruments (Ochanomizu), shopping for otaku goods (Ikebukuro, Nakano) or meeting idols before they break into fame (Suehiro-cho). All these activities in a day will definitely cost you over 1,000 yen should you purchase regular train tickets. Though the 1-Day Ticket is enough for you to cut down a little on travel costs (the savings is sufficient to buy you a packet of candy from Japan convenience stores), the 3-Day Ticket can markedly cut down transportation costs by as much as half, depending on usage. These are available for purchase in various places, but in this article we will introduce a few in the outskirts of Tokyo. There are various ways to purchase tickets, but if you are planning to arrive at Haneda Airport or Narita Airport by plane, the simplest and most straightforward option would be to acquire them at the airport. For Haneda Airport, you can purchase them at the arrival lobby's Tourist Information Center on level 2 of the International Terminal. For Narita Airport, you can buy the tickets at the arrival lobby's Keisei Bus Ticket Counter (京成バスチケットカウンター) located in both terminals 1 and 2. Hotel Otani, Hotel Monterey, Hilton Tokyo, Comfort inn Tokyo, Royal park Tokyo, Ginza Capital Hotel, ANA Intercontinental Tokyo, Asakusa View Hotel, Sakura Hotel, Shibuya Tokyu REI Hotel offer tickets. Depending on the hotel, there may be cases where only the 1-Day Ticket or only the adult ticket is available. Availability may also be tied to certain stay plans, so it would be best to inquire beforehand. The nationwide gigantic home electronics shop,Bic Camera, sells tickets in its various branches: Yurakucho branch, BICQLO in Shinjuku, Akakasa-mitsuke Station, Ikebukuro, Shibuya East, Shibuya Hachiko, Shinjuku East and West, and Sofmap in Akihabara. Proof that you are a visitor of Japan, such as a passport, is required for purchase. They are also sold in travel agent stores. More detailed information can be found in the Tokyo Metro official site. With an unlimited subway ticket on hand, you will find yourself having a bit more time to explore just that little more. You are also free to revisit the places you breezed through just the day before. The money that you save on transportation can be better spent on delicious food and souvenirs, no doubt allowing you to enjoy Tokyo more. 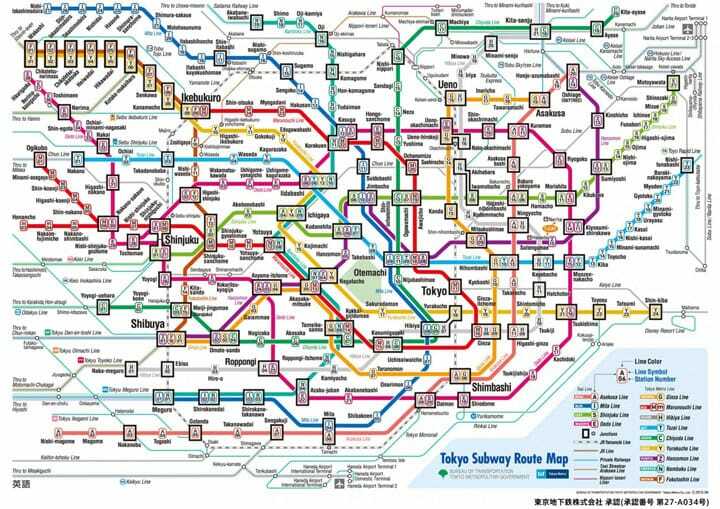 Spread open the Tokyo Metro map and plan your trip now! For MATCHA Readers Only! 5% Discount Coupons!